Burrows was a crossing guard in North Natick for 37 years until her vision loss forced her to retire at the age of 82. She has been coming to the support group for about five years. “They’re all very social,” adds fellow co-coordinator Laurice Dikmak. This is a crucial aspect of what makes MABVI’s Low Vision Peer Support Groups so valuable to their blind and visually impaired members. Perhaps equally if not more importantly than the visits from experts in vision rehabilitation, the companionship offered by meeting with others who have the same issues is vital to those coping with this disability. Currently, MABVI operates 34 support groups statewide in partnership with the Massachusetts Commission for the Blind, a State agency. The impact of vision loss on functional ability and social activities puts individuals at a significant risk for depression, even more so than other common age-related disabilities. Studies show that approximately one-third of older adults who are visually impaired experience clinical depression – about twice as high as that of the general population of older adults. Dikmak, who has both glaucoma and macular degeneration, knows all too well the significant impact vision loss can have on one’s life. Reality hit home for her one day behind the wheel. The holidays are an especially difficult time for some, particularly older adults who may not have the support network they once did. Group member Doris Porcella has been a Natick resident since 1958, and while her husband has passed, she notes that she is fortunate to have children and grandchildren who live nearby, but realizes others are not so lucky. Since MABVI is a non-profit, however, services like support groups, low vision centers, and in-home vision rehabilitation would not be possible without the support of funding partners such as Natick’s Cognex Corporation, which recently awarded MABVI with a $10,000 grant to continue their work in the area. 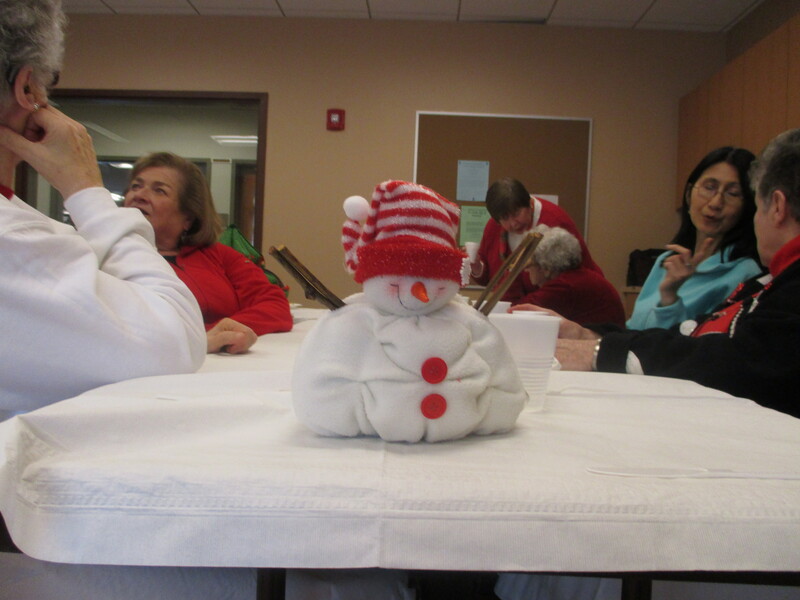 For the Natick Low Vision Peer Support Group, the experience is priceless. And while the luncheon may be over, after a Winter weather hiatus the group will continue to meet regularly as a resource for visually impaired individuals, offering support and companionship alongside useful tips and information about vision loss. And during the holidays, pie. Don’t forget the pie. 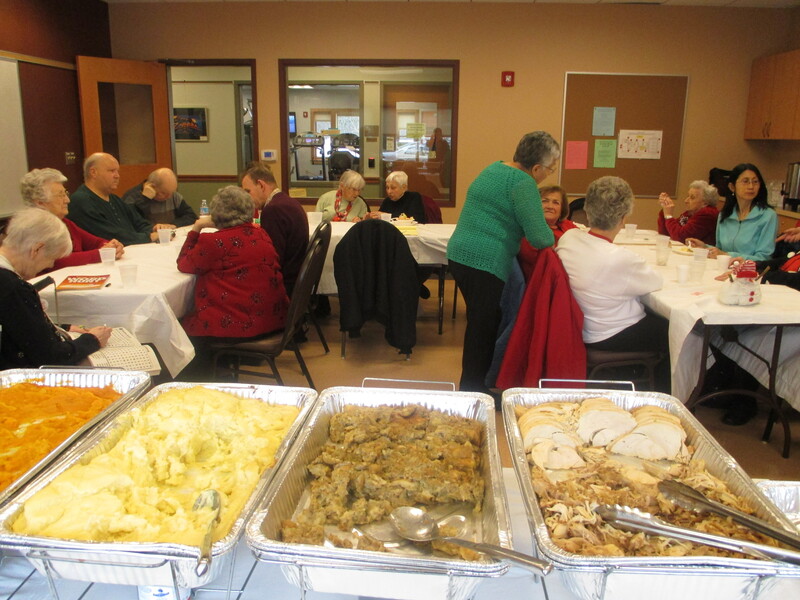 This entry was posted in Holiday, Holidays, Support Groups, Vision rehabilitation and tagged blind, Blindness, Cognex, glaucoma, Holidays, Low vision, macular degeneration, Natick, seniors, Support group, vision, Vision Loss, Visually Impaired by mabvi. Bookmark the permalink.